The Federal Reserve raised interest rates for the first time this year by 25bp and the U.S. dollar tanked. To the casual market watcher, this price action would be counterintuitive but for those of us who knew the market wanted unambiguous hawkishness from Fed Chair Janet Yellen, when she failed to deliver the trade became clear. The U.S. dollar had been under pressure throughout the morning as investors took profits ahead of today’s key event. Investors completely ignored the rate hike, focusing instead on the dot pot and Fed President Kashkari’s dissent. The decision to raise interest rates today was not unanimous as Kashkari preferred to leave rates steady this month. Although the central bank upgraded its growth and inflation forecasts and lowered its unemployment estimate, on balance, Fed officials only see 2 more rate hikes this year. To the disappointment of dollar bulls, the dot plot did not shift to 3 rounds of tightening after today’s move and Janet Yellen was not hawkish enough to rescue the dollar. While she talked positively about the labor market and business sentiment, she also felt that not much had changed since December. She did not offer anything more than to say that 3 rate hikes qualifies as gradual and they expect policy to remain accommodative for some time. The disappointment can be felt across the financial markets because aside from the fall in the dollar, 10 year Treasury yields dropped 10bp and Fed Fund futures went from pricing in a 60% chance of a 25bp hike in June to a 46% chance. These odds could fall further in the coming days as bond traders adjust expectations in light of Yellen’s comments and recent data. While retail sales and consumer prices continued to rise, the pace of growth on both fronts is significantly slower in February compared to January. USD/JPY dropped through 114 easily and appears poised to test 113.00. Euro could trade as high as 1.08 in coming days on the back of Yellen’s comments and the loss by Geert Wilders and his Freedom Party. We are still waiting for the final results but the first two polls show the Liberal Party ahead by a healthy margin. While some point to the incorrect exit polls for Brexit and US Presidential race, we still think the final tally will confirm the initial results. EUR/USD has already traded higher on the back of the results and a final confirmation could drive the currency to 1.0750 with a stronger move to come during the European trading session. In the meantime there are 3 other monetary policy announcements on the calendar tonight – the first will be the Bank of Japan followed by the Swiss National Bank and the Bank of England. None of these central banks are expected to change monetary policy but their tone will affect how the Yen, Franc and Sterling trade. With the economy improving, the Bank of Japan is widely expected to leave interest rates steady. The statement and comments made by Governor Kuroda should be relatively upbeat but 0.4% annualized consumer price growth keeps the central bank worried about low inflation. They are no closer to reaching their inflation target and for this reason, will keep policy accommodative for the foreseeable future. The BoJ is in no position to be thinking about raising interest rates and any talk is premature. The Swiss National also has their concerns. Earlier this month, SNB President Jordan said he sees a significant increase in political risks and with the Franc still “significantly overvalued”, the SNB is in a “delicate spot” because Switzerland is increasingly viewed as a safe haven. This means the Swiss National Bank will remain cautious and committed to talking down the currency. Of the 3 rate decisions, the Bank of England’s monetary policy announcement will be the most market moving simply because of the focus on sterling and the upcoming trigger of Article 50. Today, GBP popped on reports that Scottish First Minister Nicola Sturgeon would have a difficult time calling another independence referendum but gains were halted by the softer wage growth, which is important going into the monetary policy announcement. 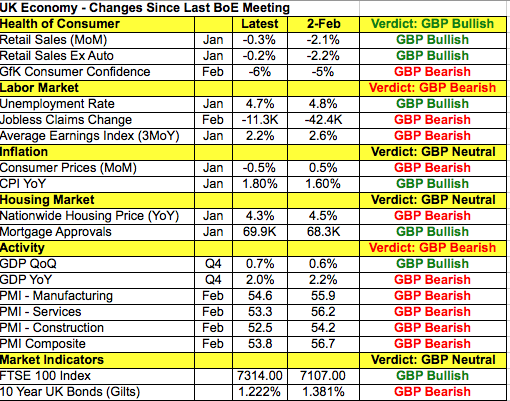 With wage growth slowing, consumer prices falling, manufacturing, service and construction sector activity easing, the BoE certainly has reasons to be concerned. The following table shows that the only area of improvement was in retail sales and the unemployment rate but spending still declined at the start of the year. Given the uncertainty posed by Brexit and the recent performance of the U.K. economy, we believe that the tone of central bank statement and/or minutes will be cautious. When the BoE last met, they upgraded their economic forecasts but Governor Carney said “the Brexit journey is really just beginning. While the direction of travel is clear, there will be twists and turns along the way.” Investors were disappointed by his cautious tone and sent sterling tumbling as a result and we think the risk is the same for tomorrow’s announcement. All three of the commodity currencies traded sharply higher against the greenback with the New Zealand dollar experiencing particularly strong gains. NZD was lifted by a narrower than expected current account deficit of -2.335b vs. -2.425b expected which bodes well for tonight’s GDP report. Fourth quarter growth is expected to have slowed at the end of the year but the risk is to upside given healthier trade and current account numbers. AUD received a boost from a continued rise in consumer confidence while the Canadian dollar was supported by rising oil prices and an uptick in existing home sales. Existing home sales rose 5.2% in February, a large improvement from the -1.3% decline reported the previous month. Oil inventories also fell less than expected. We have officially seen the top in USD/CAD and a steeper decline to 1.32 appears likely. Aside from NZ GDP, Australian labor data is due for release and according to the PMIs, labor activity was strong and lets not forget that the RBA recently expressed optimism about the jobs market.